Claude Monet, Born Oscar Claude Monet (November 14, 1840 to December 5, 1926). He was a founder of French impressionist painting, and the most consistent and prolific practitioner of the movement's philosophy of expressing one's perceptions before nature, especially as applied to plein-air landscape painting. The term Impressionism is derived from the title of his painting "Impression, Sunrise" (Impression, soleil levant). 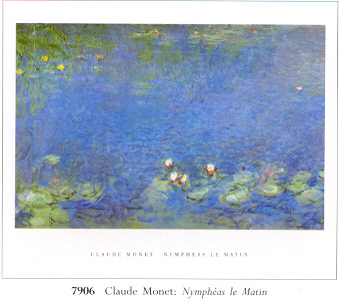 Monet was fond of painting controlled nature: his own gardens in Giverny, with its water lilies, pond, and bridge. Between 1883 and 1908, Monet traveled to the Mediterranean, where he painted landmarks, landscapes, and seascapes, such as "Bordighera". He painted an important series of paintings in Venice, Italy. This page has jewelry that is made with "Monet" Venetian Glass Beads; paying homage to and in honor of the artist, Monet, and his "lily pad" series of paintings.